On The Menu chicken parmigiana l bought and it wasn’t to my liking.The meal itself l did not like and when you compare it to the real deal it’s not worth eating ! The On The Menu range of meals is usually cheaper than some others on the market but I think just as good. Tasty crumbed chicken breast, topped with Napolitano sauce, shredded smoked ham & melted cheddar cheese, served with chunky wedges & veggies. A good option when you have no time to cook and want something other than takeaway. So Good When You're A New Mum And Craving A Parma! As far as frozen meals go, I find On The Menu to be great for the price and quality. 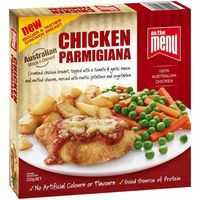 This meal is yummy and I used to buy lots of them when I was breastfeeding and glued to the couch, or just stuck at home and craving a parma. So quick and easy to heat up and for frozen parma it’s great! I like frozen meals for when I’m eating dinner solo or if I’ve had a long day. This tastes really nice for something cooked quick in the microwave! The veggies tend to always be a little firm but the small parmigiana is quite tasty! How would you rate On The Menu Chicken Parmigiana?